The Digital Marriage Proposal – Would You Propose Online? We all know that our best friends and potential loved ones are spending more time digitally connected. Whether it’s the hours a day viewing your friends profiles on Facebook or the chit-chat on Twitter, if you’ve met online, would you propose online? This question was asked of me by my friend and dating expert Jen Kirsch. In an article on Yahoo! 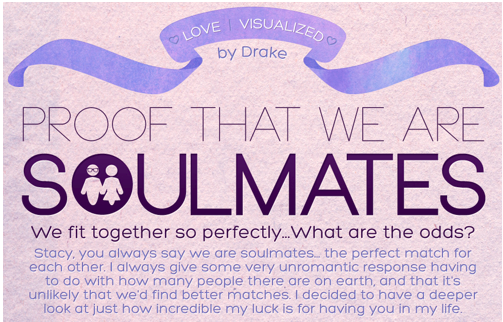 Shine, Man Proposes to Girl in Infographic, Jen takes a look into the latest and creative Valentine’s digital Infographic marriage proposal from Drake Martinet to his girlfriend, Mashable VP of Marketing and Communications, Stacy Green. Fortunately, her answer was yes. We watch each others timelines on Facebook and create a permanent digital footprint about our love lives for the world to see.? I told Jen that, I’ve? witnessed a number of these online proposals first hand and says it’s the modern equivalent of people proposing by skydiving or on a Jumbotron at a sports game. “They are living in a world that is surrounded by online activity. They look at it in the same romantic way as someone who is being proposed to at a game,” says Spira. “The people we are talking about that are proposing this way they are in the social media world and this is an offshoot of their personality habits, which are more online than offline. It’s a way for someone to get cute and creative outside of the box,” says Spira. To read the full article, click here. Many thanks to Jen for including me in her story. If you get a moment, like us at Facebook.com/CyberDatingExpert and @JulieSpira on Twitter and vote for us in the Readers’ Choice Awards for best dating blog. Julie Spira is an online dating expert,? founder of CyberDatingExpert.com, and bestselling author of The Perils of Cyber-Dating. She creates irresistible profiles for singles on the dating scene. For more dating advice, sign up for our free Weekly Flirt newsletter.